* Which side is the filler cap on? * What's the sound system like? And here's the thing - I'm now listening to all my music from an SD card. That's right, a billion tunes on a piece of plastic no bigger than my finger nail. There never were such times, as my late mother-in-law used to say. 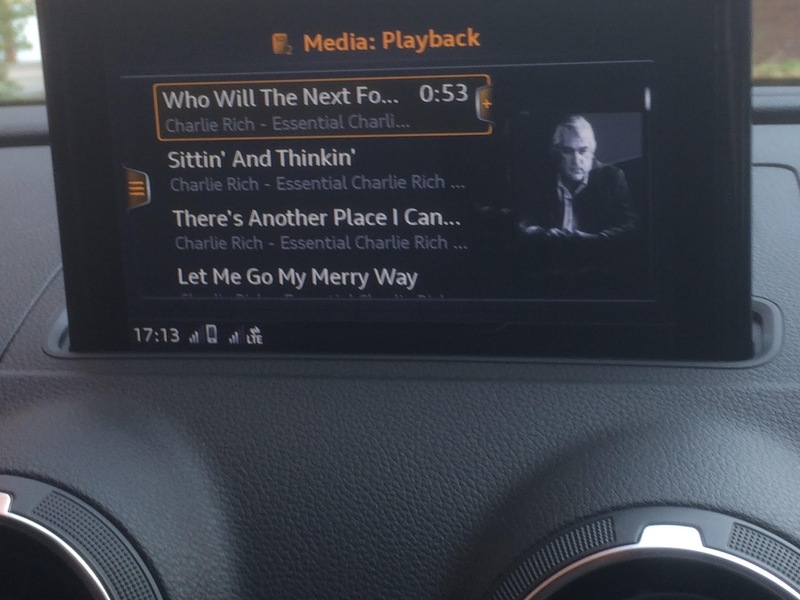 Charlie Rich has been cropping up a lot. I absolutely adore the music of Charlie Rich. I don't need any excuse, whatsoever, to listen to Charlie Rich. And I don't have to apologise for dropping Charlie Rich into the same paragraph four times. Told you. Haha. They're the same two questions I ask when getting behind the wheel of an unfamiliar vehicle, only in the reverse order. Never had a sound system as good as yours though - pictures of the artist as well? Indeed, there never were such times. My very first job, whilst still at school, was pumping gas at the local Jet garage down the road: seven hours on a Saturday (1:00 till 8:00), ditto on a Sunday, netted me the grand total of £2.10 a shift - 30 pence an hour. I manned the garage single handed, with just a transistor radio fior company. And it was attendant service. I was up and down all day long. "Fill 'er up" they'd say. "Check the oil" they'd say. "Write me a receipt for £10" they'd say; when I'd only put two quid's worth in. Is it any wonder I'd leave the filler cap on the roof of their cars when they pulled off the forecourt...? Very nice - we got a new car last year and took ownership as it also has a great sound system - The other half now drives around in my very girlie city car. Wrote about it at the time as well. Visited relatives when we were away last week and they drove us around in their new electric car - Weird as just so silent and no need to ever fill up again. Just drive home and hook up to the charging point! I hope you had a good break? Very good and got lots of good material for my blog once the mojo returns.